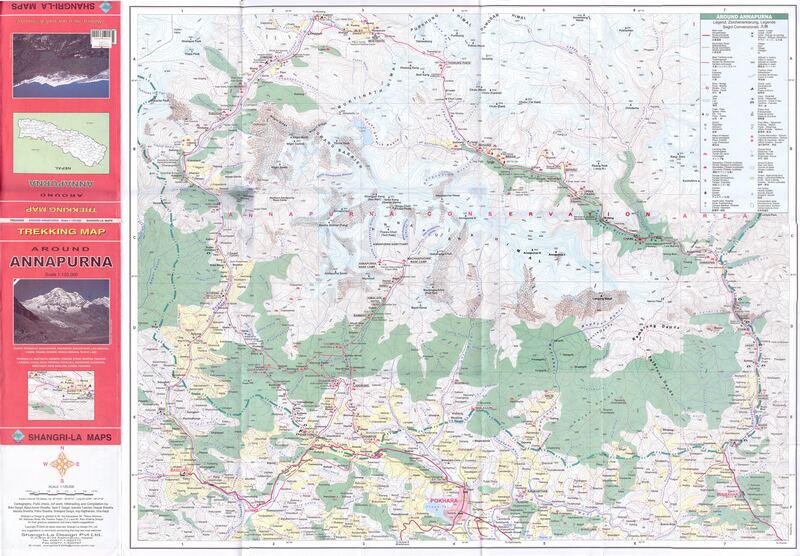 time: 7:00 – 2:00 p.m.
maps: Himalayan Map House Annapurna Circuit Trek Map. 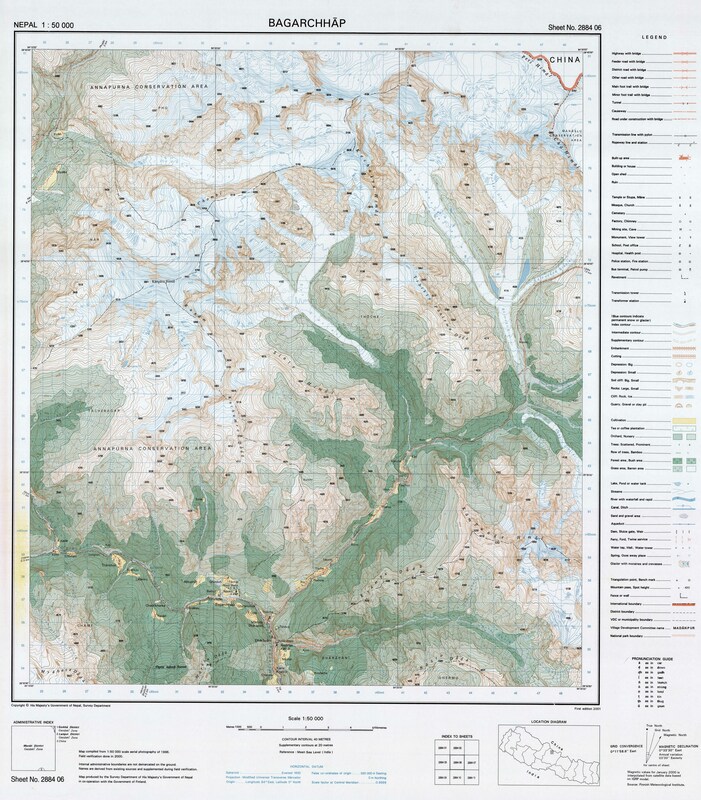 See here for info on hard copy paper maps from Himalayan Map House. The night before when we arrived at Koto it really felt like the trek was over and done. 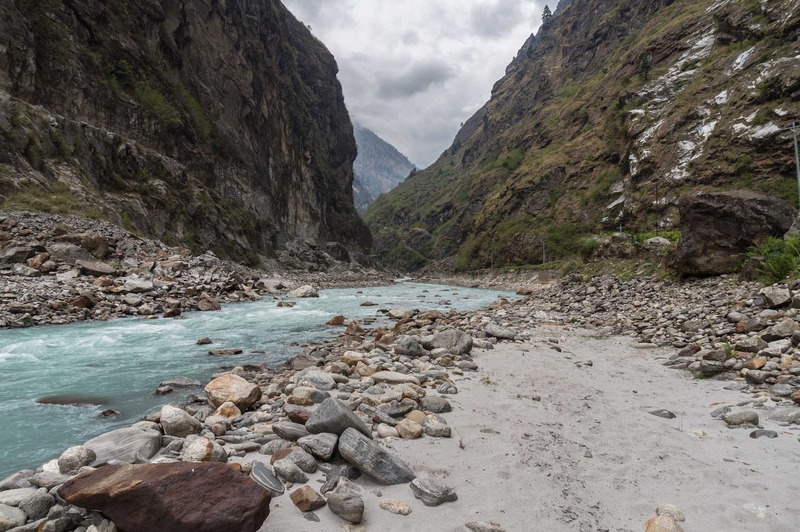 We had gone up the Kali Gandaki valley, gone across the Khumjungar Glacier and Saribung La, and gone down the Phu/Nar Valley. There was more commotion in Koto than we had seen in a couple of weeks. 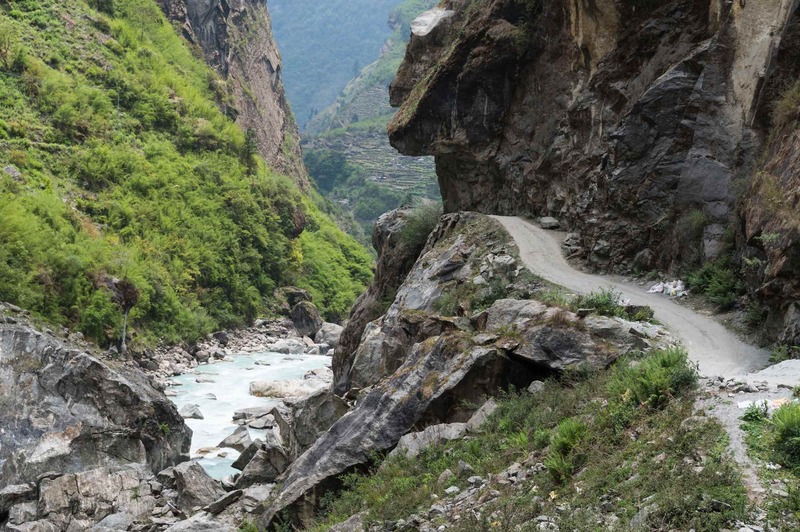 And coming up the Annapurna road were the occasional jeeps, trucks, and motorcycles. During the afternoon a couple of dozen hikers – mostly in their twenties – came through Koto on their way to Chame. I wondered how they were coping with the dust kicked up by the vehicles on their shared path. We would find out this day as we set off for Tal. I did know that we would be losing another 900 meters of altitude this day. And while we did eventually walk down into Tal by mid-afternoon, it did not start that way. The first two hours of the morning walk is uphill! Koto is at 2600 and Timang is at 2750. 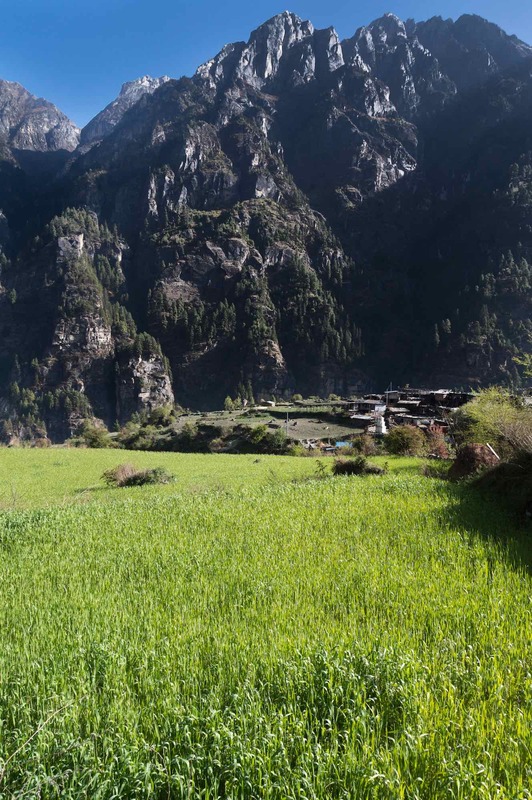 To our left were fields; to our right the steep slopes of pine-covered hills that morph into the Annapurnas! The first hour was for some reason the worst in terms of vehicle traffic. Trucks and jeeps, one after another…gauging which way the wind was blowing, I moved to one side of the road or the other and tried not to breathe for a minute while the dust cleared. No images of vehicles in this post! I put my camera away to prevent dust from getting inside. 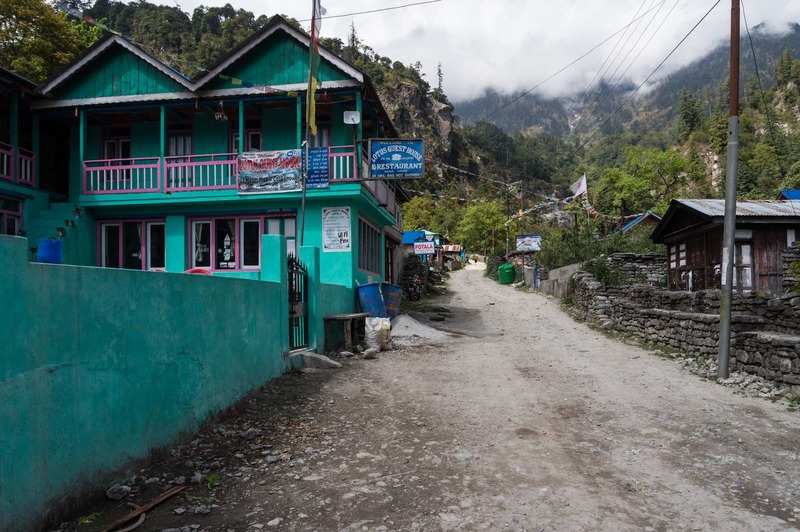 We slipped past one small farming settlement after another – Thanchowk, Timang, Danaque – and by 11 we were in Dharapani. We would have a lunch break here before finishing our walk down to Koto, with the last stretch on a trail across the river from the road. It was a treat to walk without thinking about vehicles coming from both directions. 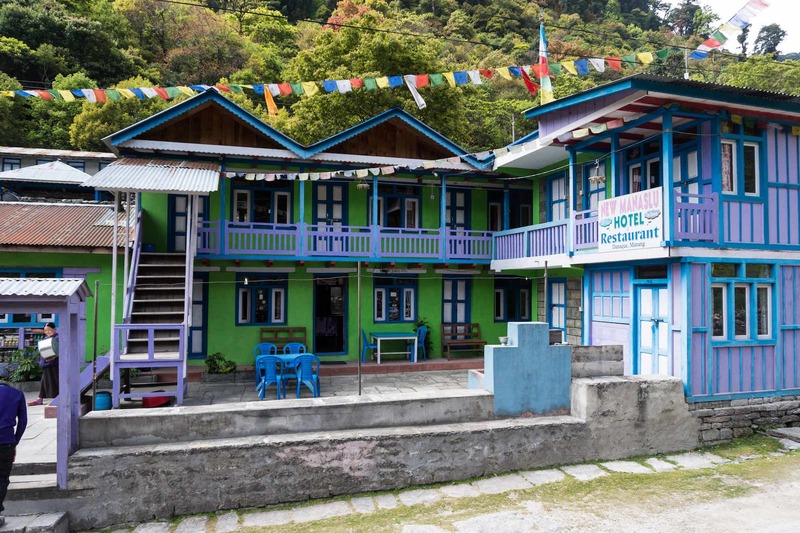 Walking through the villages certainly made clear the guesthouse economy that has developed over the past forty years since the Annapurna Circuit was created as a trekking trail. Before that, the local economy was built primarily on farming and trade. 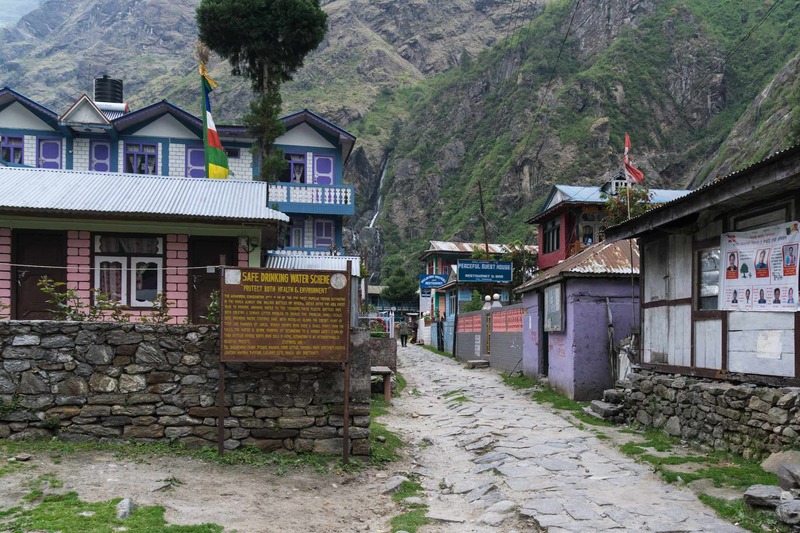 As more trekkers come up to Chame by vehicle what will happen to all those who invested in guesthouses in hopes of getting their share of the money spent on food and accommodation. Timang at 2750 would be our high point of the day. 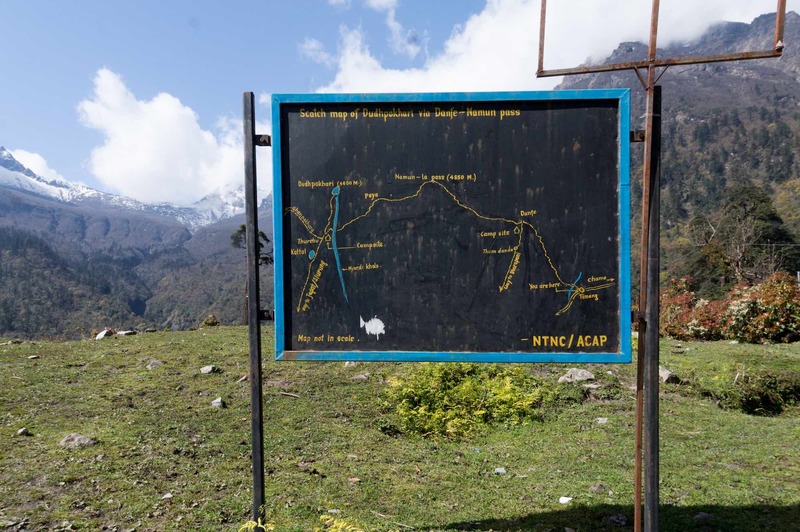 Just after Timang, there was a tired-looking ACAP trailhead map for a camping trek south into the Annapurna range. It crosses Namun La and passes by Dudh Pokhari, a lake sacred to Hindus, before coming back down descending to Siklis and a road to Pokhara. The views of the Annapurna peaks and of Lamjung Himal from another 2000 meters up would certainly be superb! 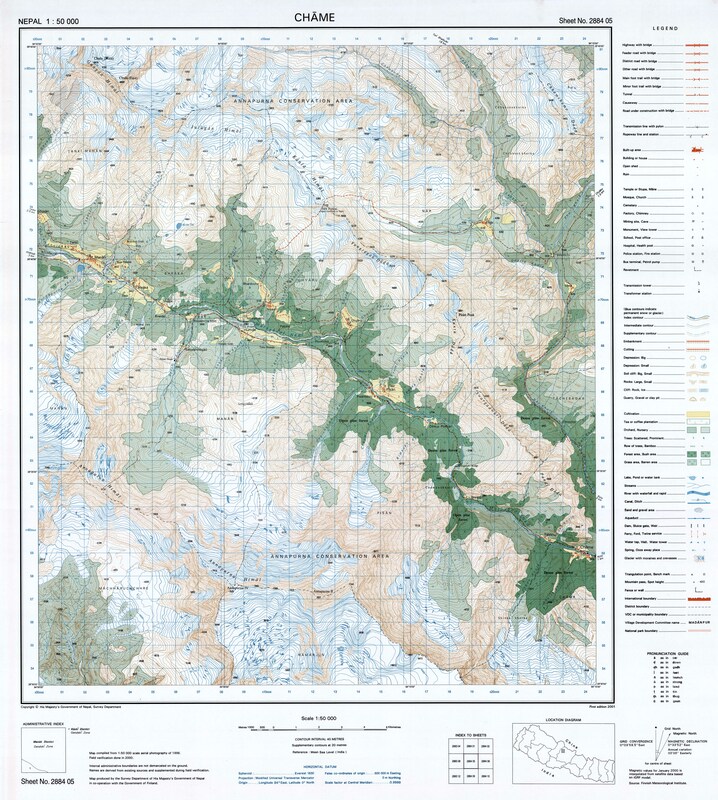 As I looked at the map, I did wonder about the acclimatization factor if you approached the pass from Timang at 2750. On the map pictured above, the pass is at 4860 meters – a 2100 meter ascent. 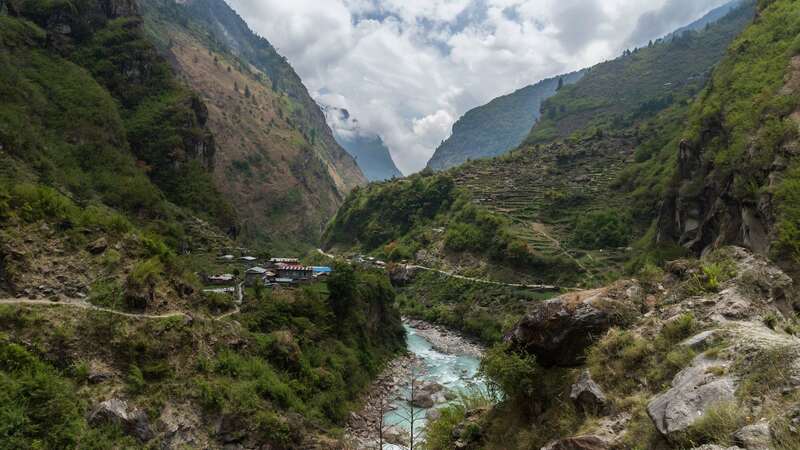 You’d figure at least three or four days would be needed to allow bodies to adapt and yet the actual distance from Timang to the pass is not all that great. Even more alarming, when I checked the Himalayan Maphouse map (see above) that evening the altitude indicated is 5560 meters. That is 700 more than the elevation on the map board! 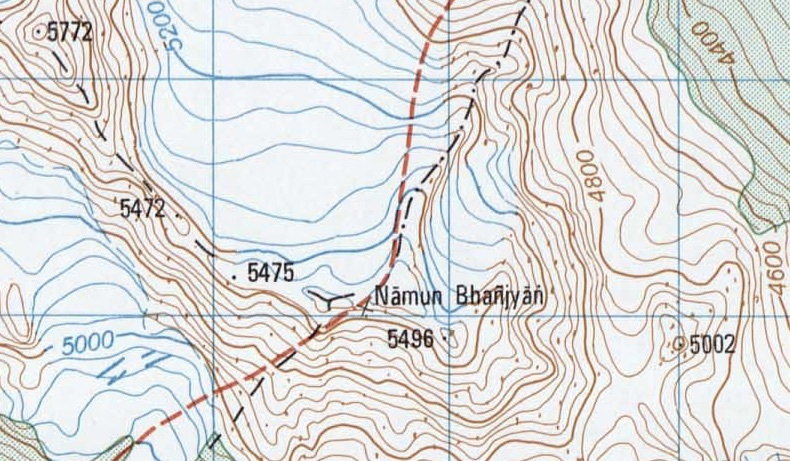 A look at the Nepal Govt topo from 2000 provided yet a third number, one close to the Himalayan Map House figure – it was 5496. 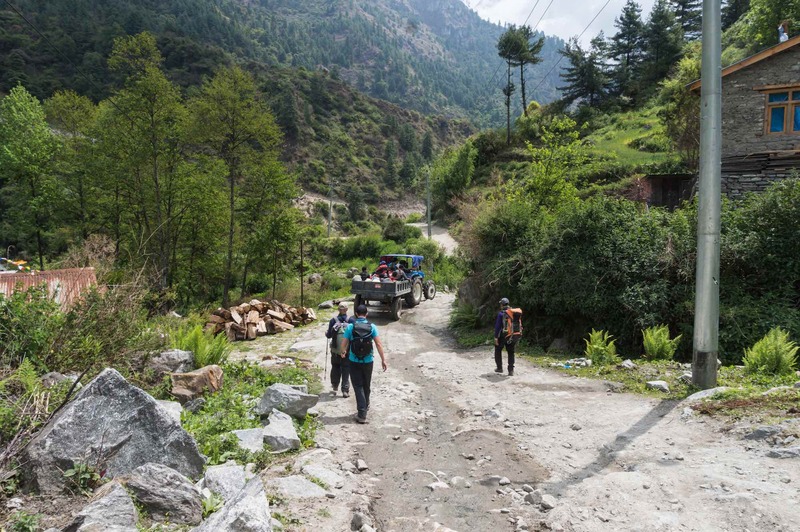 If trails like this one are going to be offered as alternatives to walking on the Besi Sahar – Manang Road, then we need to start with accurate numbers. At 5560 Namun La would be higher than Thorung La’s 5416! So what is the actual altitude? Who is right? An email to Mountain Kingdoms received this response based on a trek the representative had made in the fall of 2017. 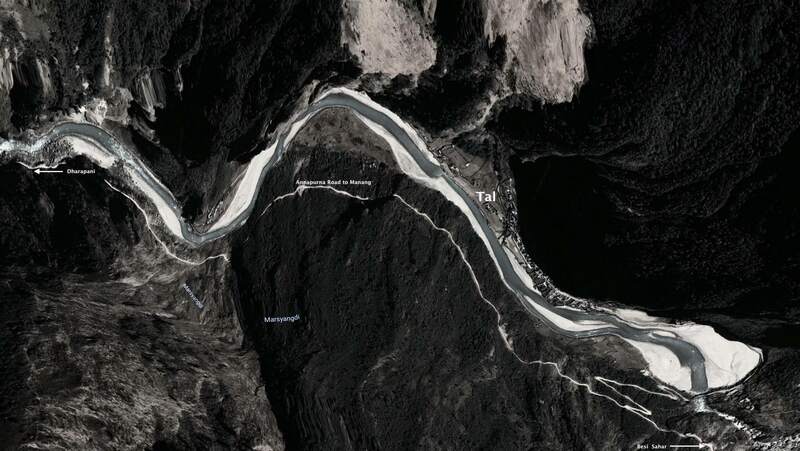 The height you are looking at on the map of 5560m is a spot height – i.e., the height of an adjacent hill – it’s not the height of the actual pass, which is 4850m. I had a friend accompanying me when I did this trek last November and his Garmin showed this to be an accurate height for the pass. 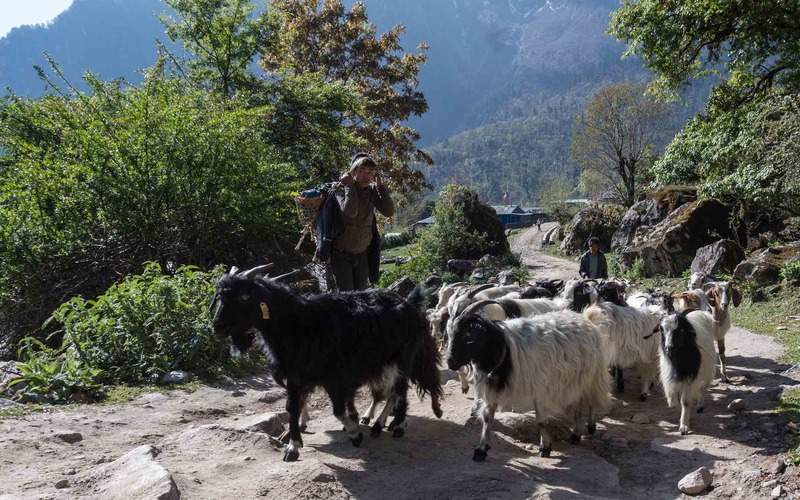 As the classic Annapurna Circuit dies as a trekking route, the locals can either forget about appealing to trekkers or they can redefine what Annapurna trekking means by developing alternatives that will take them off the dusty and increasingly busy road. 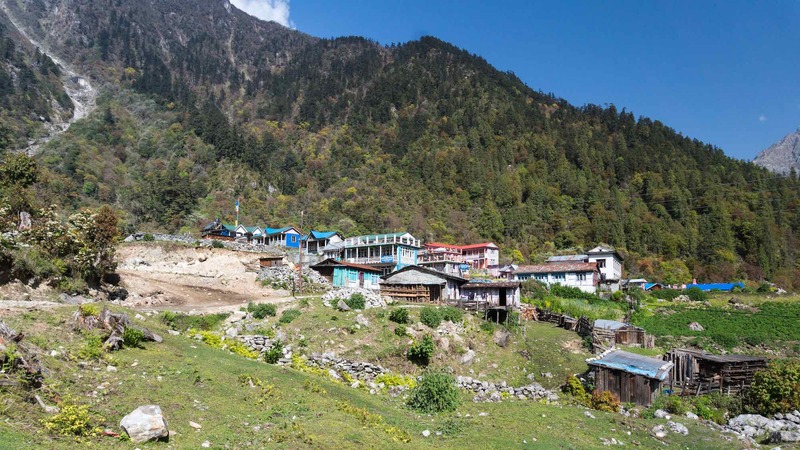 This high altitude trek would be one such offering; others include the Nar/Phu trek and the traverse from Manang to Jomsom via Tilicho lake. 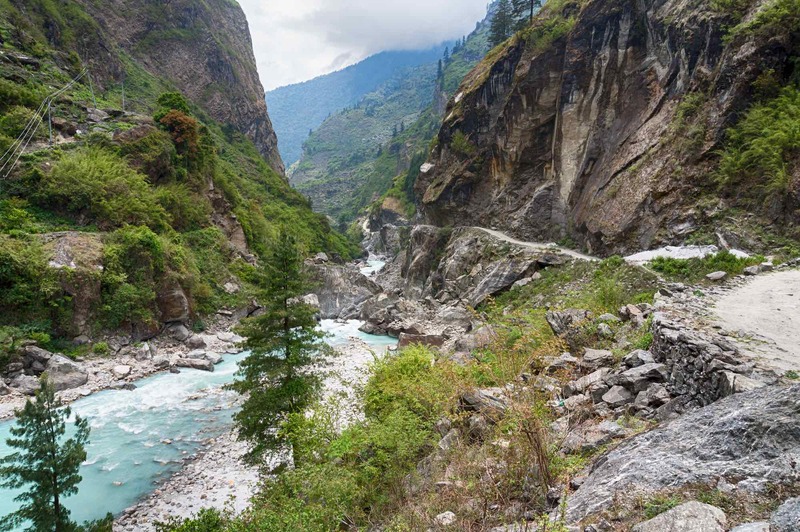 the Annapurna Base Camp is already an established off-road trek. 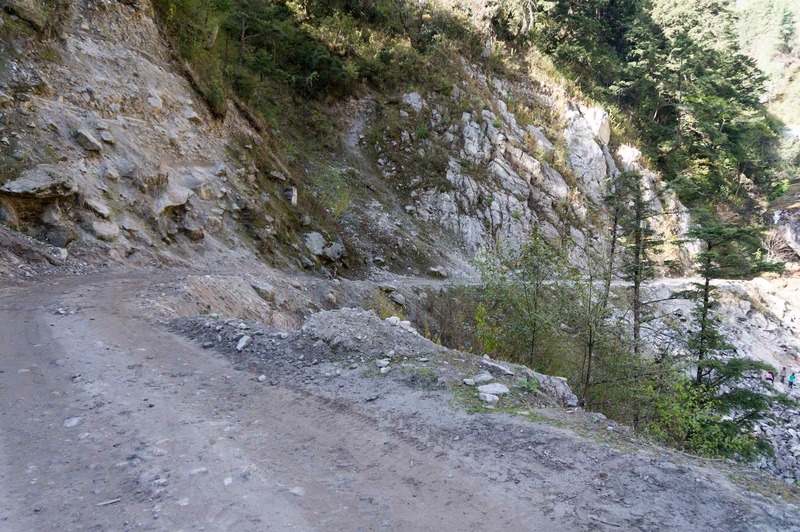 Unfortunately for the guesthouse owners, off-road would mean away from their properties on the Annapurna road. 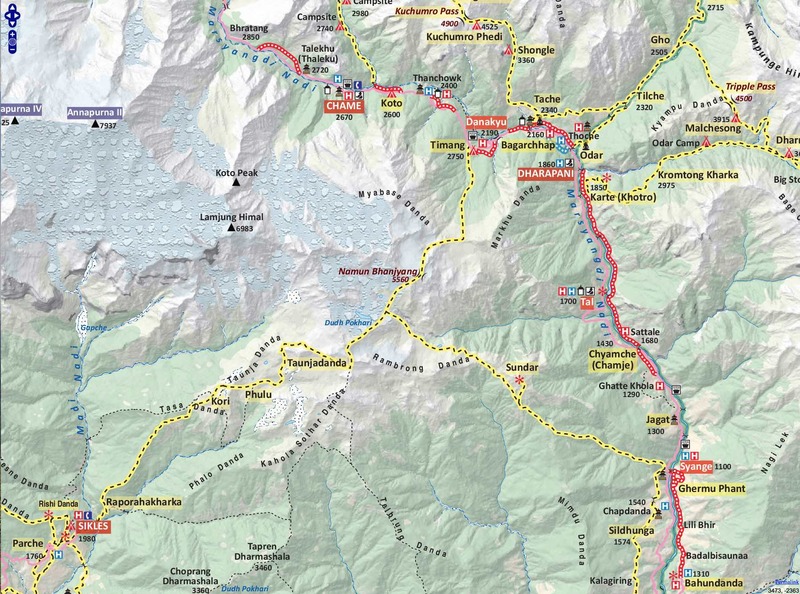 (See here for a map which shows the Mountain Kingdoms trek route (Siklis – Dudh Pokhari – Namun La – Timang – Dharapani) over nine days. 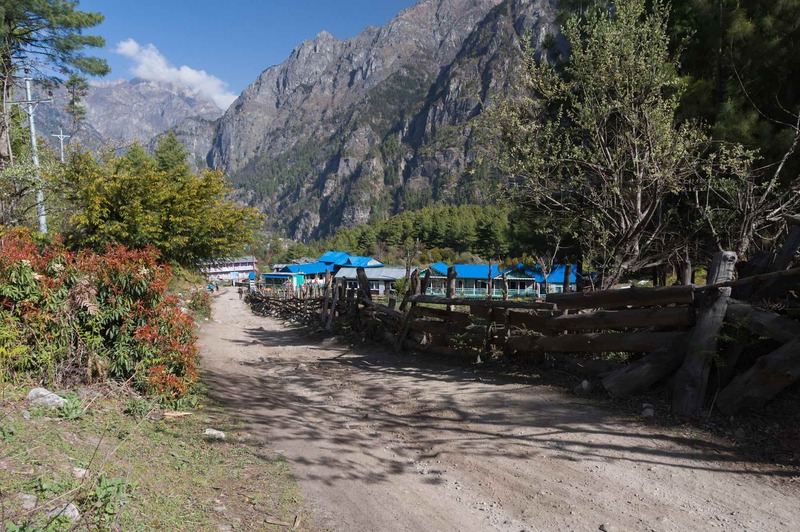 Combining it with a walk up the Naar/Phu valley or a traverse from Manang to Jomsom via Tilicho Lake would undoubtedly make for a different experience than what is left of the Annapurna Circuit! While the future may lie in leaving the classic route and going high, we were staying low! 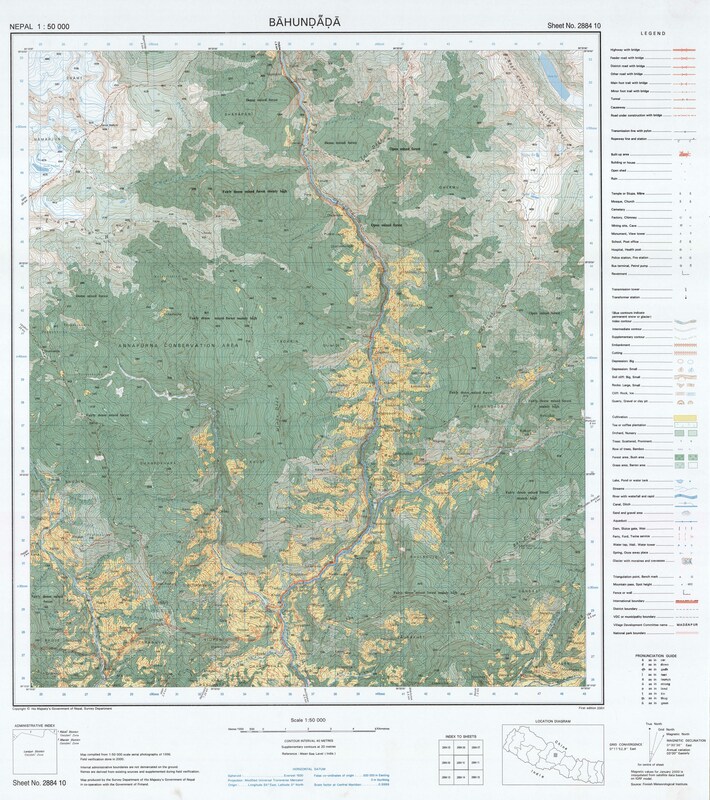 Next up – Danaque – or Danakyu on both the topo and HMH maps. I sipped on my first bottle of Coca-Cola of the trek and, after a half-hour pause, we were on the downhill again. By 11 we would be sitting in the dining hall of a Dharapani guesthouse and enjoying the shade while our cook team whipped up their last lunch! As we approached Karte (see the image above) an alternative trail leading upriver from the village was visible. 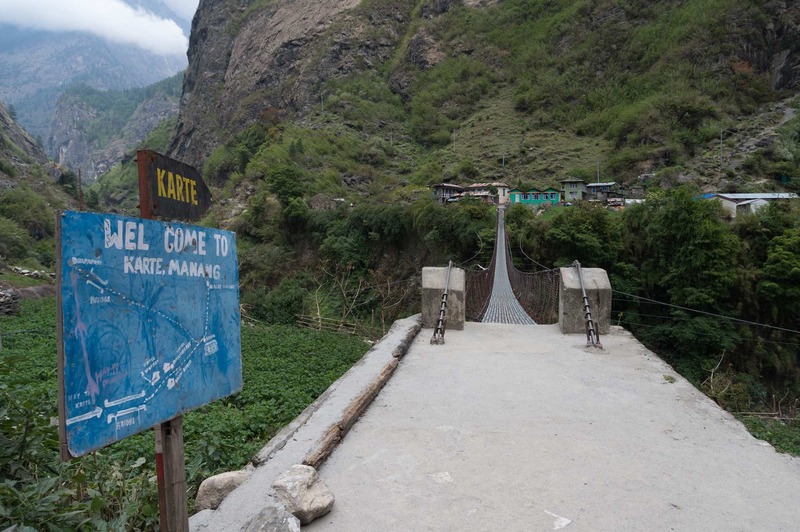 When we got to the bridge crossing the Marsyangdi, the map answered the question of where that trail went – up to Dharapani. 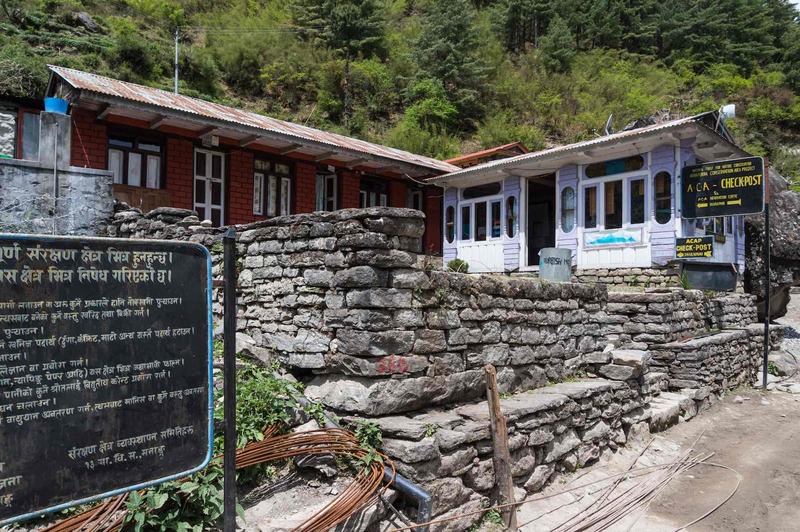 The sign also points trekkers to three guesthouses in the village. We kept on to the main road and soon came to another pedestrian bridge, which we did cross. It took a half-hour to reach Tal, away from the road on the other side of the river. Along the way we were able to walk down to the river and take in some beautiful beach views; the bends in the river here have led to the collection sediment piling up over the millennia! Our guesthouse side lawn would be our last campsite of the trek. it was fairly quiet in the village. 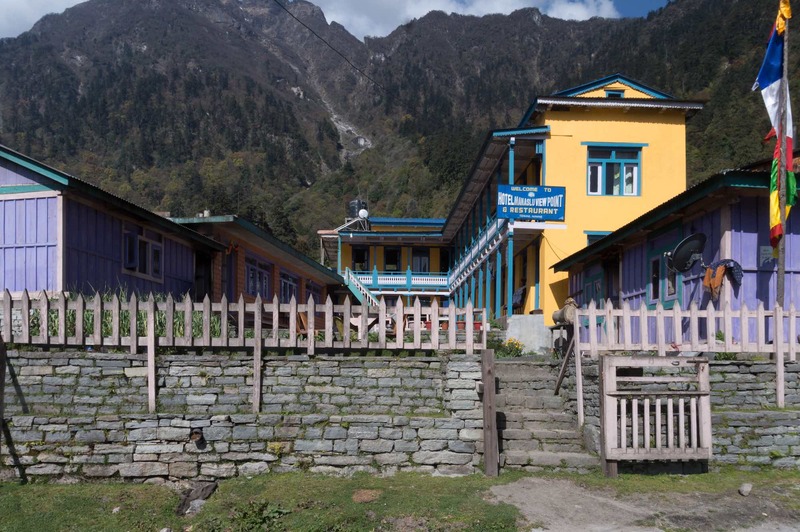 While there at least a dozen guesthouses, there seemed to be few trekkers about. 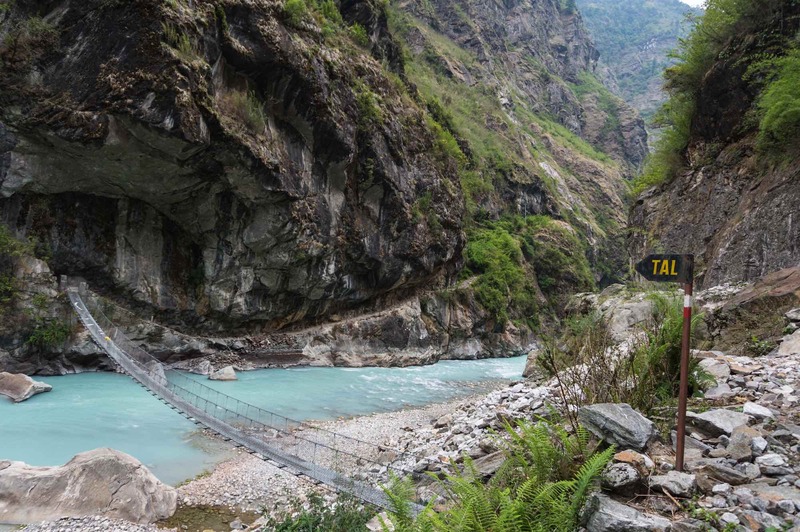 Increasingly, they are skipping the lower section of the classic Annapurna Circuit – i.e. 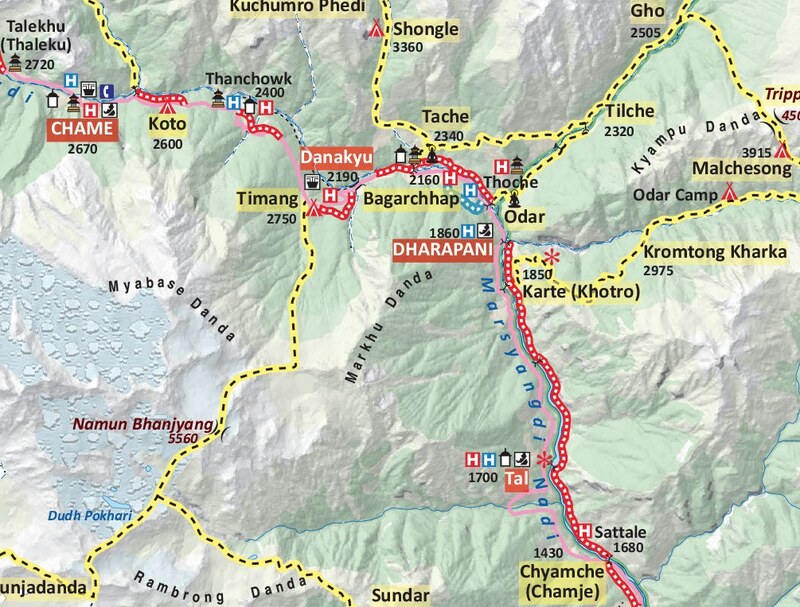 the part from Besi Sahar to Dharapani, and just taking a jeep ride up to Dharapani or even Chame. The trip can be done in eight hours or so. 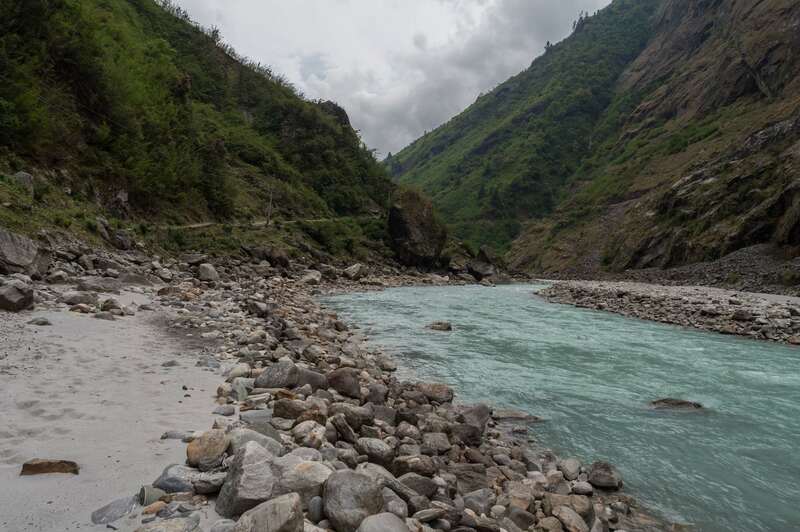 Vehicles can access the village from the south end, where there is a bridge over the river to the switchback road up to the Manang -Besi Sahar road. Between the village entry gate pictured below and the river is a parking lot. In the early evening, I took a walk to the south end of the village. 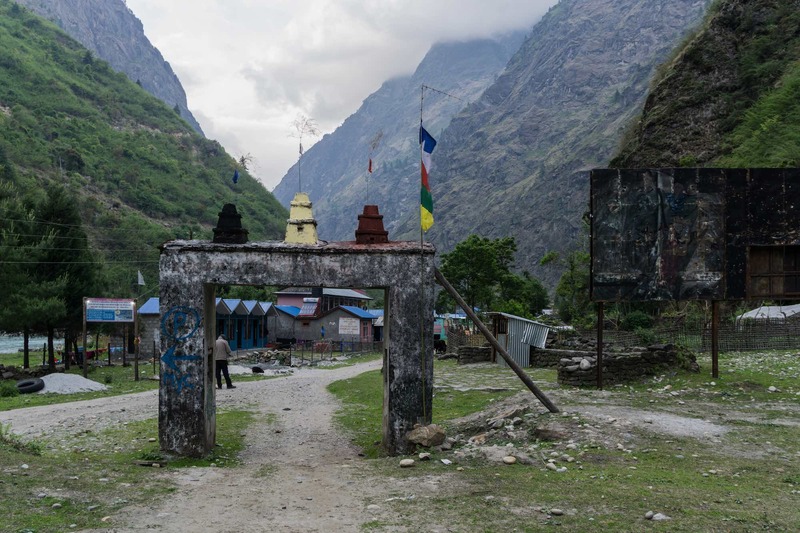 The mildew-covered entrance gate and a dilapidated billboard make a negative first impression on trekkers coming up the road from Chamje. The guesthouse dog gave everyone a reason to make use of those earplugs again. 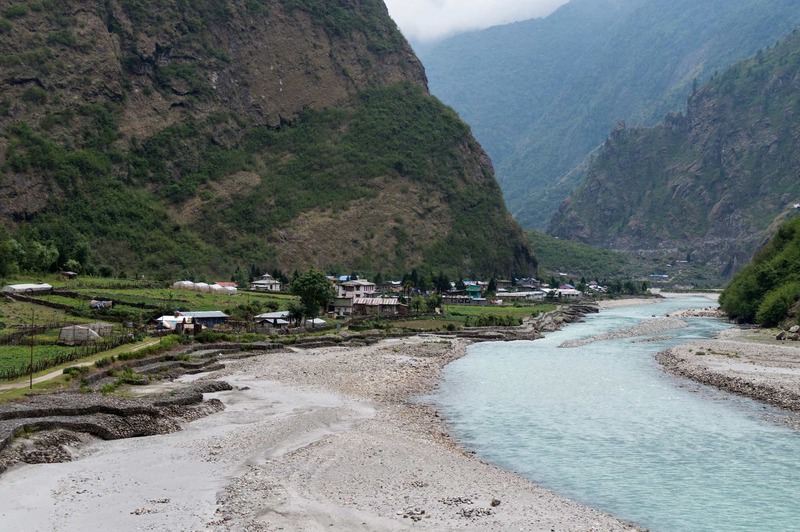 Since we had left the Kali Gandaki villages night times were fairly quiet. In Koto and Tal, we were reintroduced to village life! 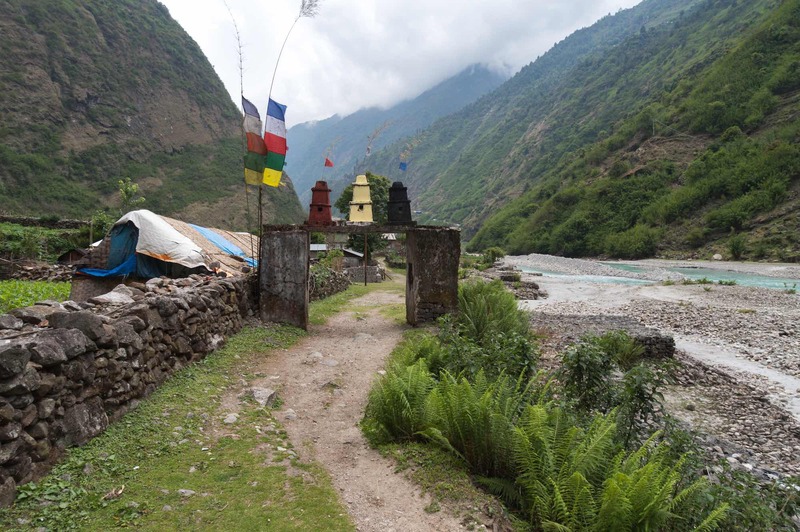 The next day would be our last in the Annapurna region. 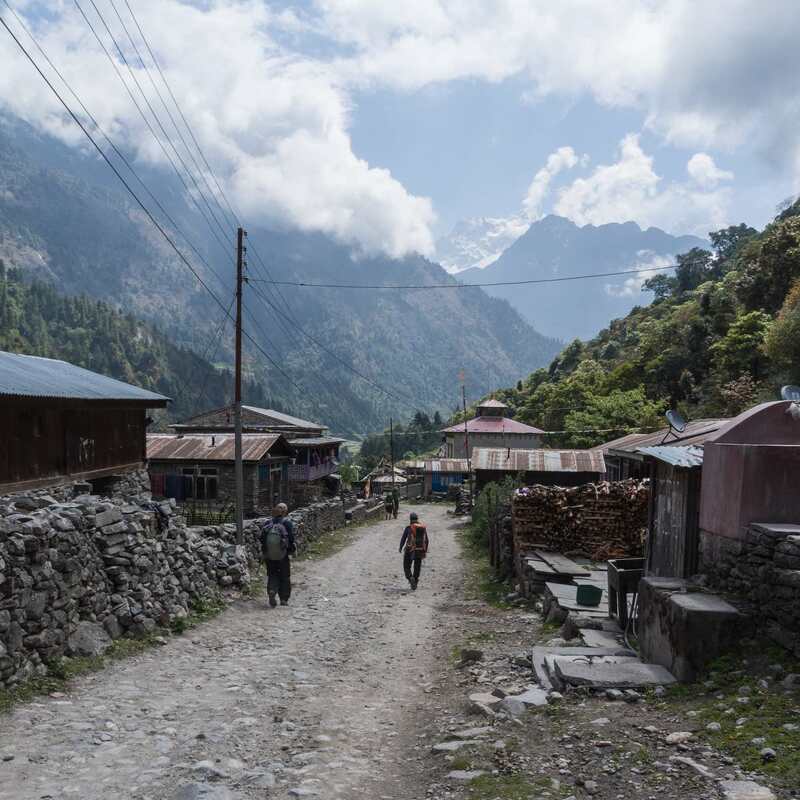 On the itinerary was a half-day of walking to Chamje and then a jeep ride to Besi Sahar – the trip was almost over though our arrival in Koto already felt like the end of the journey. Ending the trek at Koto and gaining a day by driving from Koto to Besi Sahar. Gaining another day by driving from Kagbeni to Chele and then walking to Ghiling from there. The roads up to Lo Manthang from Jomsom and from Besi Sahar to Manang will only get better and see more vehicles. Better roads mean worse trekking. 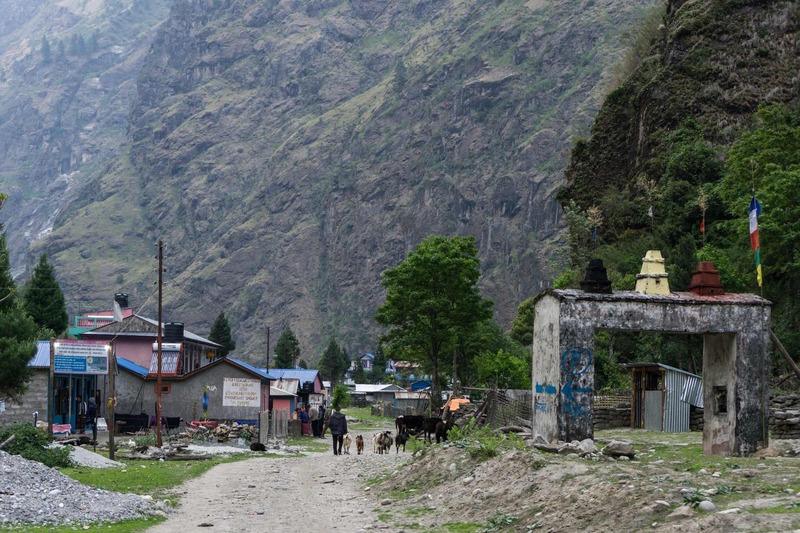 The trek route and itinerary need to change in response to what is happening.